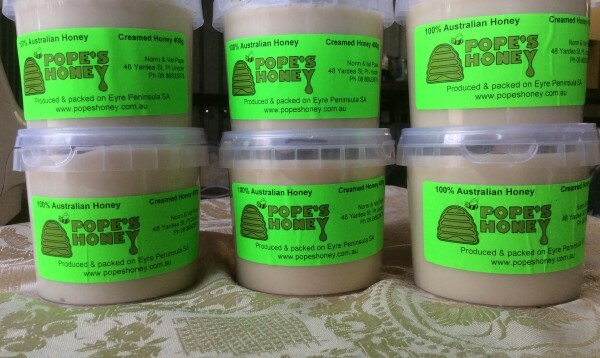 Pope’s honey is a family farming enterprise based in Port Lincoln. South Australia. Norm and Val started on their honey path with Norm’s first bees in Port Lincoln in 1979. 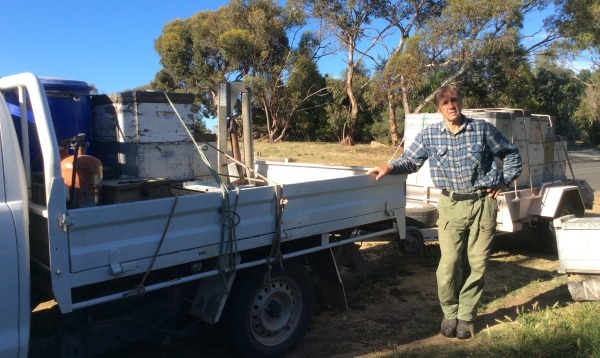 Norm had developed an interest in bees in his childhood, which became a passion and a career, he left electrical contracting in 1985 to become a commercial Apiarist. 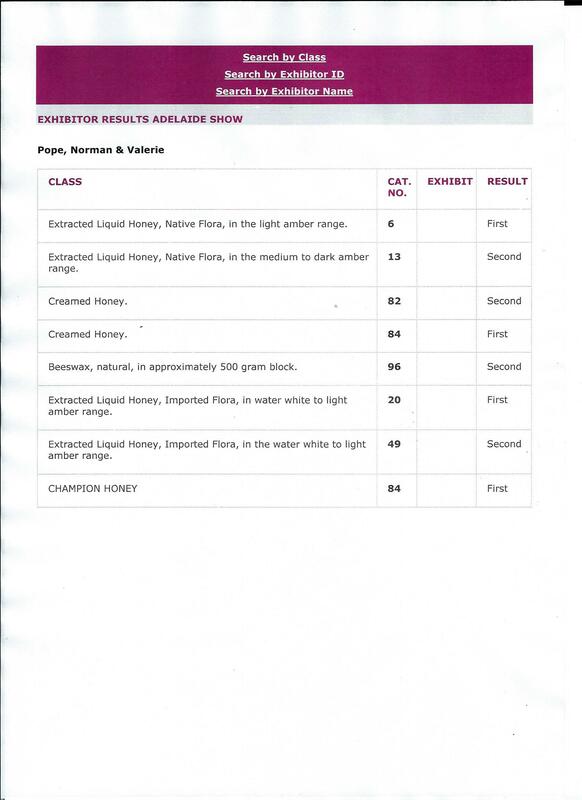 Numerous awards during the many years of beekeeping for Honey and Wax from the state Beekeeping Association and Adelaide show. 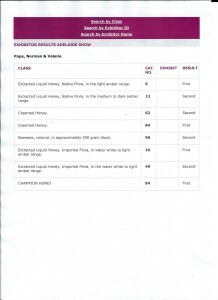 -2015 – Champion Honey.Three first and three second. Creamed honey for the 4th consecutive year is first in its section. 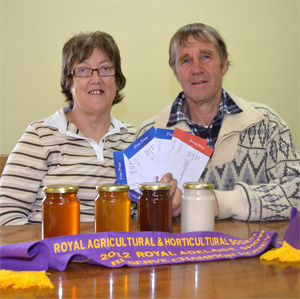 – 2014 – 2nd prize Creamed honey and 3rd prize for the Sugar gum. 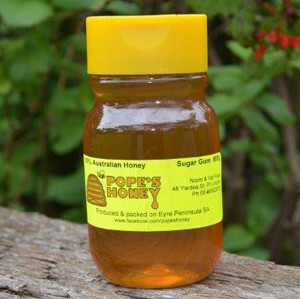 Try our delightful variety of honeys collected from the abundant flora of lower Eyre Peninsula. Buy local, taste the difference and support an SA farmer. These beautiful little honey jars come in 140g and 75g. Also a cute individual serve 25g. They become a perfect addition to a gift basket. They have graced many tables as a wedding favour. 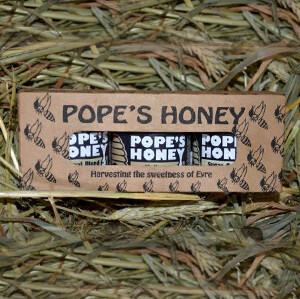 Pope’s Honey variety pack has three varieties of our best honey in 75g jars. Packaged for a perfect gift. Our ever popular and award winning creamed honey in a convenient 400g tub. Liquid honey is packaged in plastic buckets sizes. Bring your own container to the farm gate and we can fill any size. The 500g upside down – USD packaging is mess free. Ideal for children and when you just want a squirt of honey. This neat little square 500g container is tamper evident and travels very well by car or plane. A round 300g is also available. At markets when we are selling honey, we become a captive audience for the many questions people have concerning the busy honeybees. Unfortunately we don’t usually have the time to fully satisfy the queries. We have decided to set up a visit to the work place and some quality time with the beekeeper. Tours are by Appointment only – we need to remain efficient apiarists to keep a good supply of honey. Location is a 15 minute drive from the Port Lincoln CBD. Take a short drive on Western approach road then turn left onto woods road to farm Gate 16. Look for the sign on the left. A glass sided hive to observe the bees at work is planned. It is show time in South Australia again. The royal Adelaide Show showcases the best of the best in South Australia. Pope’s Honey has shone again. A two weeks anxious wait from when Bear Express carefully transported our precious entries to Adelaide to finding the results online. 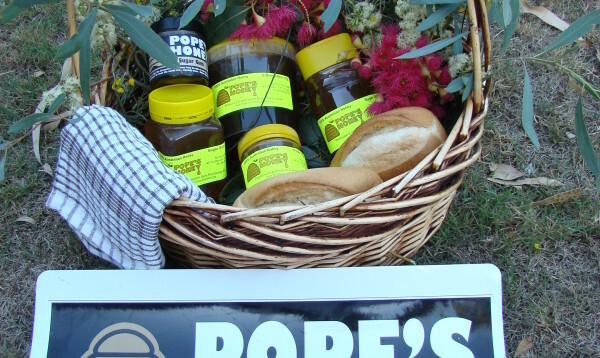 Pope’s Honey took out three first and three second prizes AND the very sought-after Champion Honey – the best in the honey section of the Adelaide Royal Show. As first time champion honey winner last year was very exciting. The second year is exciting but also affirms that we have kept up our quality standard. Our creamed honey has taken out first in its section for the 4th time in a row. Keeping the quality to an excellent level requires careful management with the vast seasonal variations. Thanks to all who encourage us to keep striving for excellence. 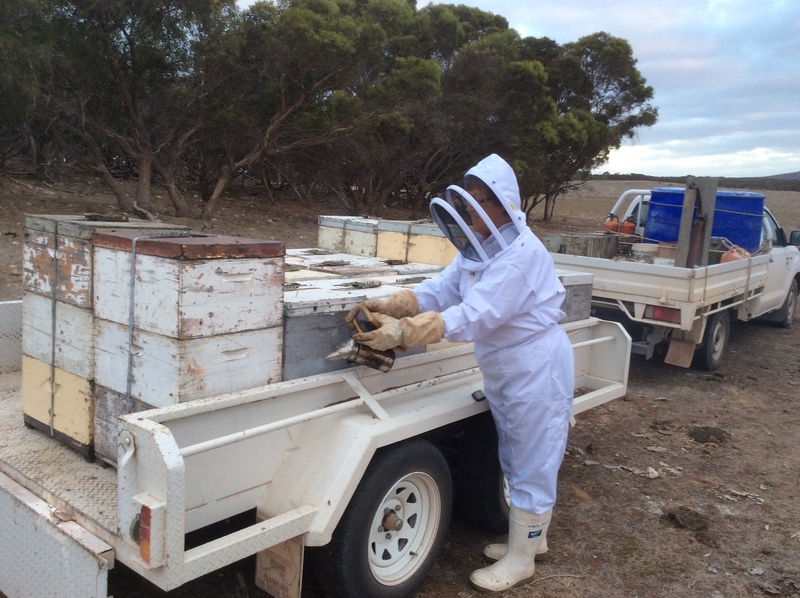 Enjoy our beautiful honey collected from our lovely Lower Eyre Peninsula. When close to home, Val can get the opportunity to get into the apiary. Transporting bees from one floral source to another is a major consideration for apiarists. There are many ways to move bees. We have chosen to keep it all simple kind to bees and kind to the beekeeper. A trailer sack truck and ramps is all that Norm requires. Moving into the quiet of the day, the apiary has some bees flying about and wearing protective clothing is a good choice. A puff or two of smoke and the bees quieten down. this makes it a simple task to slide the sack truck under the boxes and push the bee boxes the short distance up the ramps onto the trailer. Saves on gym fees. A little more smoke as they are on the trailer, and they stay settled in the box If the beekeeper has timed it so it is on dark the bees are not wanting to fly. If there is a time to wait for the day to finish, its a good time to see what is in the eski lunch box. Pictured is Norm and Val making the most of the early cool morning to have a quiet moment before Norm takes the netted bees to their new floral source. Transporting bees from one floral location to the next is a thought through process. 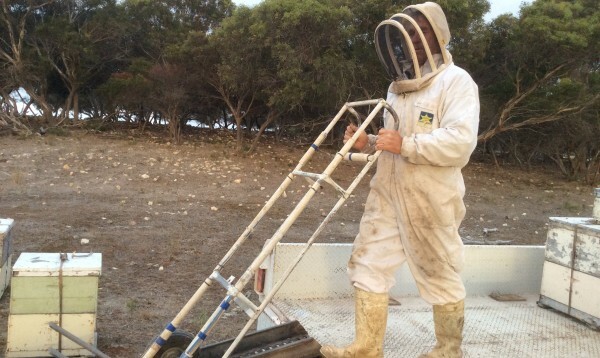 Each apiarist has their own practices. We have found picking up the bees late afternoon allows all the bees to come home and then transport them as it moves into evening. This means no bees are left behind. If it is a long distance, Norm comes home and he and the bees rest – yes bees rest. It is an early start in the morning before the bees are flying. We don’t close the entrances but do put shade cloth over the hives to ensure no bees escape. This is especially true when opening the many farm gates that sometimes lie between the road and the location selected. 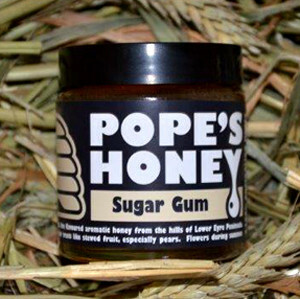 We felt we wanted to celebrate the success of Pope’s Honey. We are passionate about caring for our bees and producing a good product. We are delighted that the Port Lincoln community has celebrated with us. 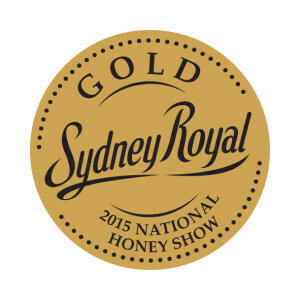 Winning 1st and 2nd prize in the National Honey Show in Sydney is amazing. But a Gold in the commercial section in the National competition is still unbelievable. A first or second prize is given as to the best in honey presented in that section. The Gold Award was required to score above 90%. No one else accomplished that in 2015. WOOHOO what will be our next challenge. 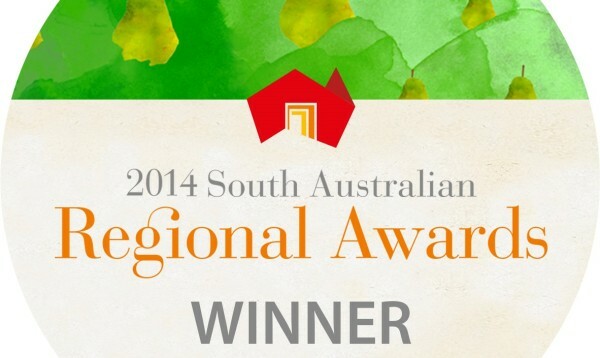 It is a privilege to be awarded the Winners of the Regional Award for Eyre Peninsula and Whyalla for Premium Food. It is now our privilege to be finalist in the South Australian Food Award to be held on 20th November In Adelaide. These nights are a celebration of what is wonderful in our region and State of South Australia. It is an inspiration to mingle with many hard working people passionate about their product. 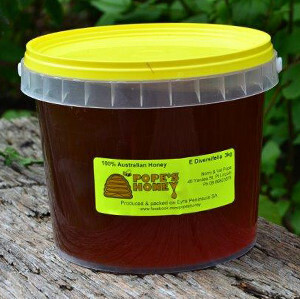 It stirs our passion to care for our bees and produce good honey and apiary products. 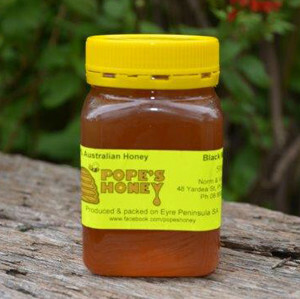 Pope’s Honey Eucalyptus Honeys are Winners. 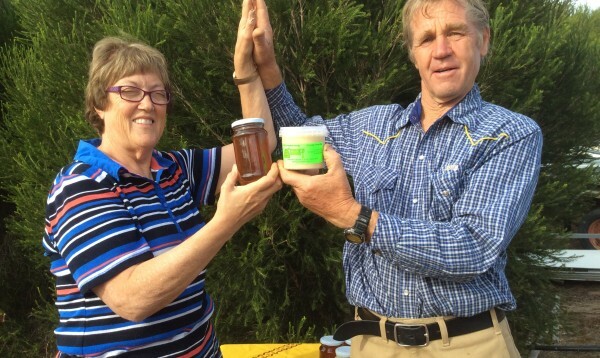 Honey collected from the Eyre Peninsula Eucalypts by Pope’s Honey have taken out awards in the Sydney Easter Show. 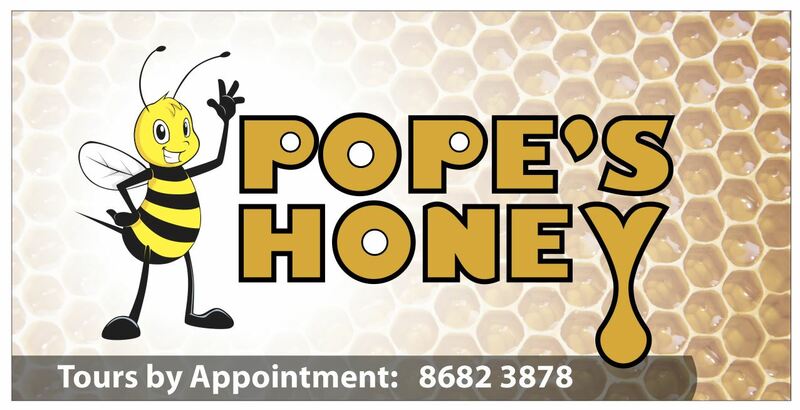 Checking online we discovered this week that Pope’s Honey took out 3 prizes. Cummins Mallee or the Eucalyptus Peninsularis took first in the liquid honey in the light amber colour for Australian eucalyptus. The Fenix Eucalypt took second in the Eucalyptus medium colour. This one is so recently extracted that it is not on the shelf yet – soon. The third and only other section of liquid honey is the dark colour. The Eucalyptus Incrassate commonly known as Ridge Fruited Mallee took out first. This is the non –commercial section of the competition. It has been a year of many different Eucalyptus flowering and producing honey. Everyone loves the thought of owning some gold but it is nothing like the gold received in recognition of excellence from the Australian honey industry. 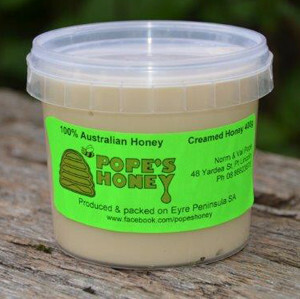 Pope’s Honey in receiving the Gold medal from the Sydney Royal National Honey Show for creamed honey has shown itself to be amongst Australia’s best produce. With just two entries in the commercial section for creamed honey, we received gold for both. No other commercial honey entered received this high award. The honey judges do not give the award unless it meets their exacting standard. 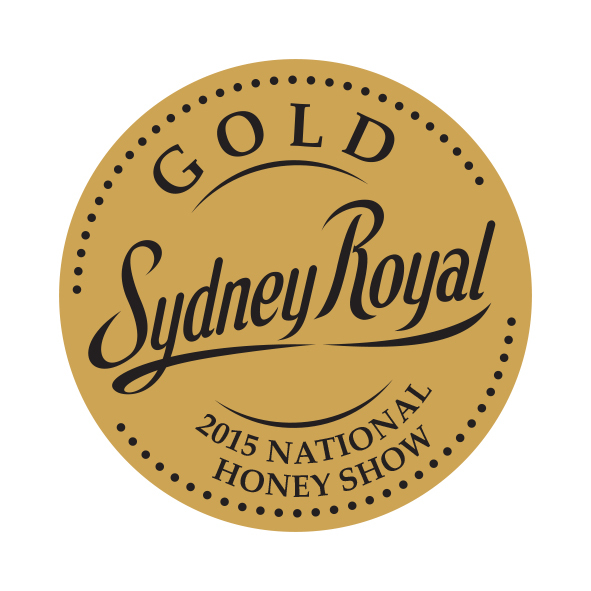 We will have the opportunity to display our gold medal on Pope’s Honey winning product. Ready for another day with the bees in the field. 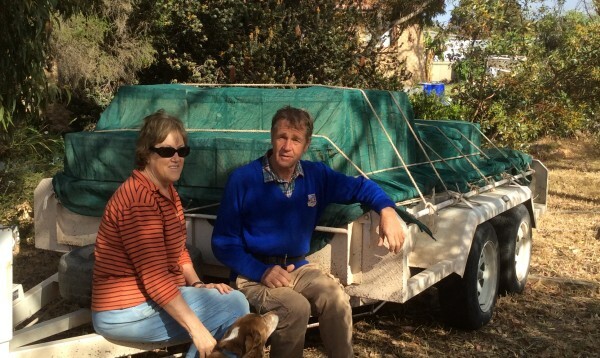 The team of three work well together – the Toyota, the trailer and the experienced beekeeper Norm. A small rig in comparison to many but the honey comes home and the tyres are small in size and cost. A month has passed since the South Australian Eyre Peninsula and Whyalla Regional Awards presentation dinner. What a thrill to be awarded the winner of the Food section. 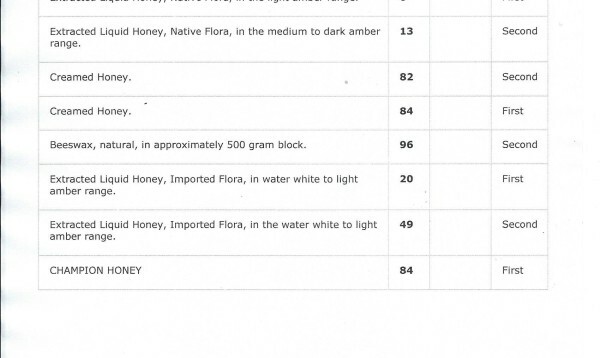 Always knew honey was liquid gold. We have always set our sights on being good at what we do. Firstly as Electrical contractors and then as apiarists. If a job is worth doing it is worth doing well. Yes we have worked hard and often haven’t come up to our high standard BUT it is the local community who have been our support. I am always amazed at the amount of honey that leaves our door to go to markets, shops, interstate and overseas. 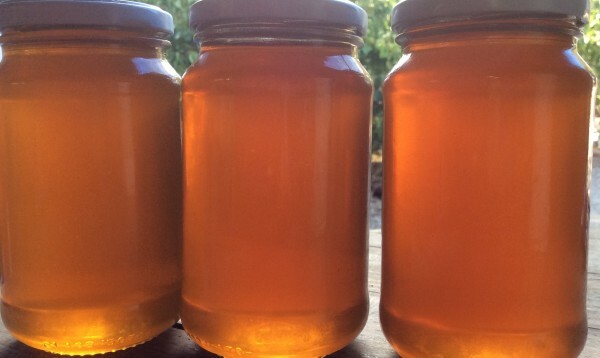 The wait is over and the results of hard work of preparing the honey have been revealed. Champion Honey is the ultimate goal and this year we have accomplished that for the first time. It is not hard to guess that our creamed honey is the champion. We am so looking forward to the sash. The Sugar Gum likewise seems to attract attention and that has a first prize ticket. In total we have 3 first and 4 second plus the very converted Champion Honey. We love the opportunity to showcase Eyre Peninsula. Our products are available from in Port Lincoln by arrangement.